June 2015 – Homeless and Loving It! When we left Petrified Forest NP on 2/3/15 I was promising to keep the blog current during our Spring wanderings as for the past two years I’ve fallen off the blog wagon and still haven’t made up for the lapses! Someday maybe I’ll learn not to make promises I can’t keep. We are now settled in for the Summer on San Juan Island with great Wifi and hopefully time to catch up. We hope you won’t get whiplash as we jump back and forth from the cool, green, watery northwest to the desert southwest. Stop number one as we left PEFO was to get a new tire for the trailer in Show Low, AZ. Rather than back track up to I 40 we then followed AZ 260 over to Cottonwood, AZ and our campground at Dead Horse Ranch SP. 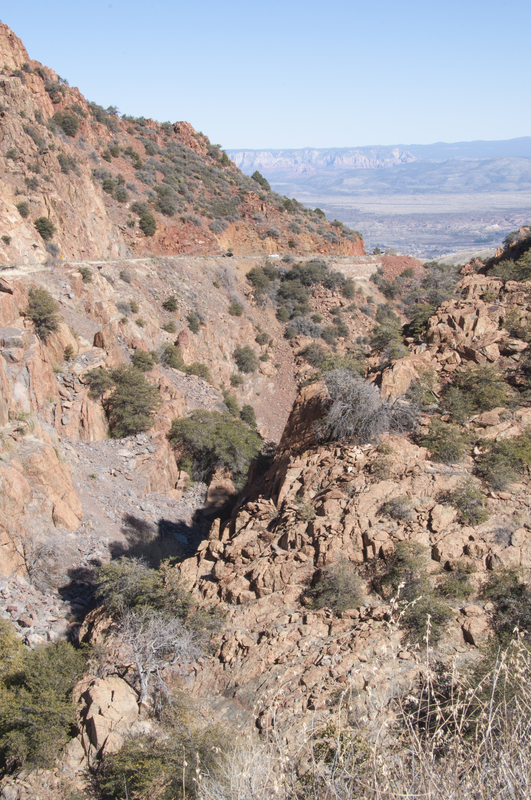 AZ 260 is a scenic route that winds through the Sitgreaves National Forest and along the Mogollon Rim (pronounced Mug- ee-yon). This is where the Colorado Plateau ends and drops 3,000 feet into the Tonto NF and Phoenix valley. Dead Horse Ranch SP is a wonderful place to stay and one loop is set up for larger rigs with drive-thru sites, electric and water hook-ups and a central gray water dump. The name comes from the previous owners who when looking for a ranch to buy had viewed several. They asked their children “which should we buy? The kids answered, the one with the dead horse!” The name stuck. The town of Cottonwood and nearby Jerome were mining boom towns that flourished and failed but are now retirement meccas and tourist destinations. With Sedona about 20 miles away it is a very popular spot. We could have subtitled this entry “What Happens When Things Don’t Turn Out The Way You Expect”. We had made arrangements with a mobile RV repair to come as our washer dryer combo and oven weren’t working. The dryer needed to be man handled out of its small cabinet by both Steve and the repairman and have the filter flushed. Unfortunately the park water pressure was low so the machine had to be loaded onto the back of the truck and taken to the fairgrounds. The repairman couldn’t wait for this so when Steve returned he was able to slide it off the truck onto the picnic table. Now we had to wait 2 days until the repairman came back. We’ve kidded about “rednecks” living in trailer parks with old cars and washers outside. Now we had one! The stove just needed a new pilot light assembly and that was ordered. Just an hour before the repairman returned our electric system went down. The diagnosis was we needed a new converter. That was ordered and arrived the next day. The repairman made trip number three, installed the part, tested it and the part was defective!! OK, so now we are due to leave the following day. We check with the park and we can have the spot for two more days. We cancel two days at our next park. A rush order, yet another visit by the mobile repairman who by this time felt like family and we are finally back in one piece. All of these unplanned incidents had cut into our sightseeing. We know we will return to explore the area again. We did enjoy what we got to see and people we met. One night while sitting in camp we met a couple who have very interesting hobbies. He plays in a 1860 baseball league which plays by the original rules, uses authentic equipment and wears period uniforms. She is active in a women’s group called Sisters On The Fly. The group began for women who enjoyed fly fishing. Quickly it expanded to many other activities. Several of the women (our acquaintance included) travel in vintage RVs. She had just finished refurbishing a 1970s era trailer. This Summer the group will caravan from Chicago to Santa Monica along Rt. 66. They will start with 50 trailers and end with over 300. The other couple we first met at a gas station and later visited at our campsite. They now live in Cottonwood after losing both their home and their RV park business near San Diego to wildfires in 2001. Along the way they had lived in Anacortes, WA where we would take the ferry to San Juan Island. After visiting with us they reciprocated by inviting us to their home for dinner. Many times you meet people and know it is one of the “for a reason” friendships and you might not ever see them again. Travel isn’t always about the places you go but the people you meet along the way. 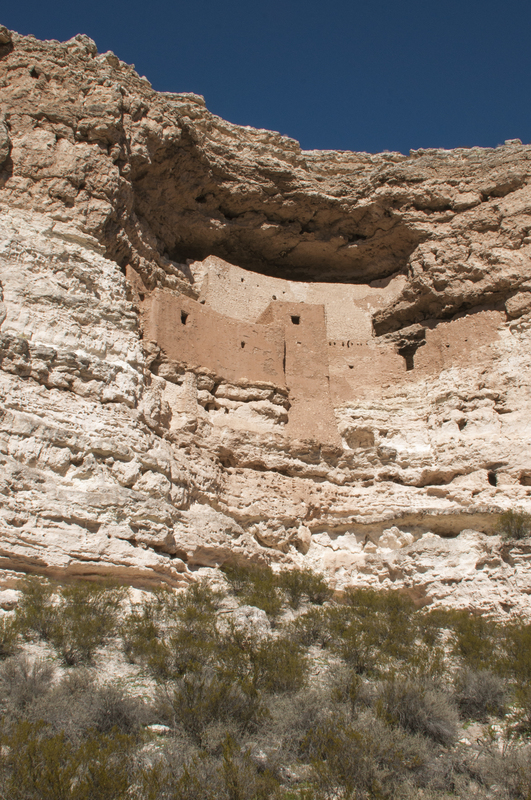 Montezuma’s Castle NM… now that’s a real high rise building! 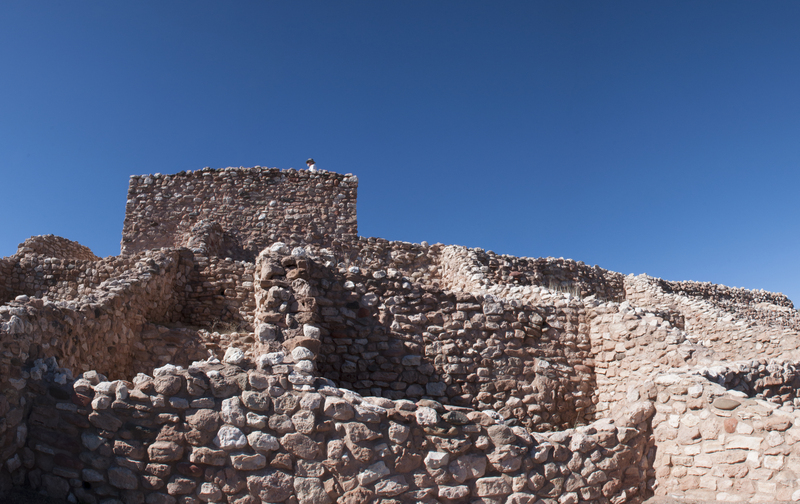 We did get to Sedona and Red Rock Country on two drives, visited Prescott Valley for a Costco stop but saw beautiful scenery along the way, visited Montezuma’s Castle NM and Tuzigoot NM and had dinner in Jerome. 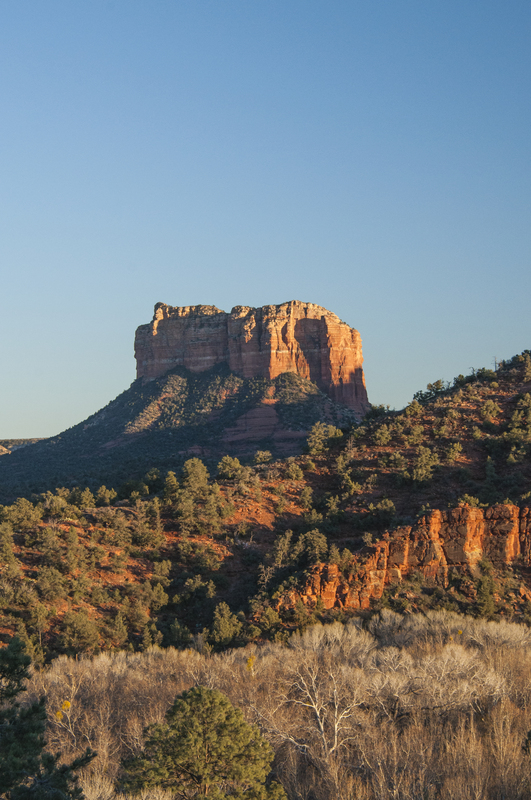 There is so much to explore in the Coconino National Forest and trails around Sedona. We wanted to take one of the Pink Jeep off road trips and a railroad trip but these fell by the way. 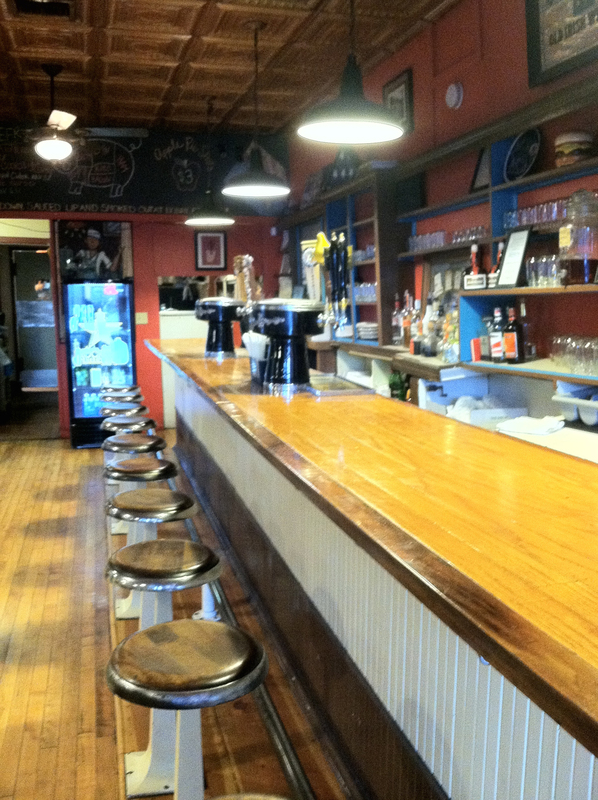 The dinner in Jerome was at an excellent BBQ spot called The English Kitchen. The history of the building included being established by a Chinese man during the mining boom and at one point the basement was an opium den. So enjoy the few pictures we took. We will be back!